Students planning to have a lucrative career in the field of management often try their best to get admission in their desired BBA program offered by an elite university. Every university has limited number of seats and conducts the BBA entrance examination to admit the deserving candidates only. Our coaching institute holds a record of preparing the maximum number of successful candidates, so you can always trust our result-oriented teaching methods. We have trained and experienced teachers that have been preparing management students for years. With their diligently crafted tutorial on each module, you are sure to excel in the upcoming BBA examination. Our BBA entrance coaching in Delhi near Munirka not only prepares students for the written examination but also gives due attention to improve their soft skills. Whether you want to pursue your BBA program taking Finance, Marketing, Logistics, Operation or Human resource as the core subject, our coaching classes will help you throughout. Job Positions Business Development Executive, Financial Analyst, Data Analyst, Operations team leader, Business Consultant etc. BBA is a 3-year long undergraduate course that teaches students the basics of business management. This course equips BBA students with the right skill set and knowledge necessary to excel in the management field. India has many elite BBA colleges, but the number of seats it offers is limited. It is why most of the reputed colleges organize the BBA entrance examination to select the best BBA aspirants from the herd. Our BBA entrance coaching in Delhi has prepared thousands of BBA aspirants that are today studying in their favorite BBA college. To appear for any BBA entrance examination, a candidate must have cleared its 10+2 with a minimum of 50%. The marking scheme, syllabus, and exam pattern will vary from one BBA college to another, so it is important that the BBA aspirants check it properly before applying for a particular college or university. DU JAT, NPAT BBA, IPMAT, GGSIPU CET BBA, and SET BBA are among the top entrance BBA tests for undergraduate-level management programs. However, all the BBA colleges assess candidates on English, Quantitative Aptitude, General Awareness, and Analytical Reasoning. 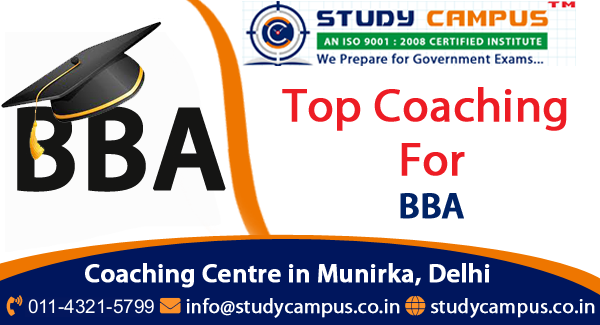 Located in South Delhi, our institute is considered to be the best BBA coaching in South Delhi, Munirka by our students. We receive several inquiries for our BBA course from different areas including the Hauz Khas, JNU, Saket, R K Puram, Ber Sarai, Malviya Nagar, Moti Bag, and many other areas as well. Joining a professional course without knowing its scope is like throwing the darts in the dark. BBA graduates get a lot of job opportunities across different sectors. However, the scope of getting a good job is multiplied when a BBA graduate completes his MBA too. Financial Analyst, Marketing Executive, SAP Consultant, and Operations Team Leader are some of the designations on which you can be hired on. Why Choose Study Campus Coaching for BBA Entrance? Study campus in New Delhi is the best place for the preparation of BBA Entrance Coaching Classes in South Delhi (Munirka). For your reference, the exam pattern of DU JAT has been shared below. To know the details of other entrance examinations and our result-oriented coaching classes for CET BBA entrance, you should visit our coaching institute at the earliest. Note: The above information about BBA or BBA entrance are based on internet search only.